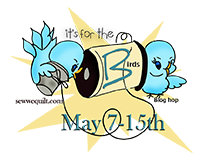 " It's For The Birds " Blog Hop! Come flap your wings with me. I might be flapping with you.. but have to wait to hear back as I'm going to be out of town for some of the days. If the day works out for me, we can fly together. :) I have an owl pattern that this would be a good excuse to bust out and make. And I thought you said you were going to take it easy, lol! I'm hoping to fly as well. I have a cute pattern I want to make.